A few weeks ago, amid the pollution- and Zika-filled media run-up to Rio, a press release issued by the Olympic organizing committee for PyeongChang, Korea (where the 2018 Winter Olympics will take place) received little notice. The single-page communiqué carried news about a white striped tiger named Soohorang. Rendered with computer graphics, the creature wore a cheesy grin and posed like a track star. Soohorang, you see, had just been chosen as the next official Olympics mascot. The practice of choosing a creature to represent each Olympics is now in its 44th year. It’s a job that falls to the host city’s organizing committee, which frequently relies on marketing research to create the mascot and public surveys to choose one, with final approval resting with the International Olympic Committee. While some mascots are human (children, usually), most have been animals (bears, raccoons, owls, etc.) And with the advent of CGI, several mascots have fallen into what’s generously termed the fantasy-creature category. The most obvious explanation is that Olympic mascots are created by a committee—and you know how that too-many-cooks adage goes. Another complication is that an Olympic mascot has to do the double duty of embodying both the idealistic competitive principles of the games while also signifying the unique cultural attributes of the host country and city. It's why we’ve seen a given country’s beloved local creature dressed up in athletic attire and wearing the Olympic rings. 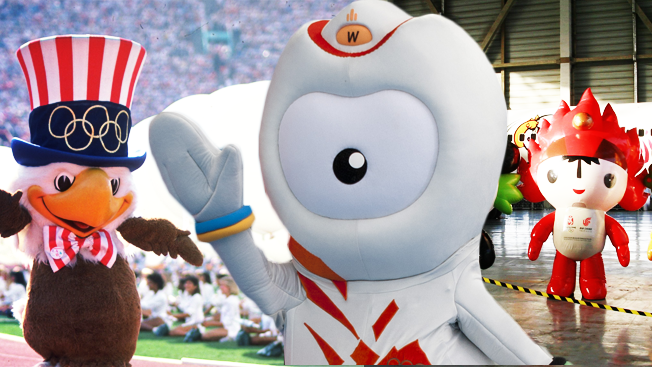 But according to Alan Behr, an intellectual property attorney with the New York firm of Phillips Nizer, the central problem is that Olympic mascots have to resonate with audiences both locally and globally. The mandate of piling on multiple layers of symbolism onto a creature that must be clever, appealing and nationalistic without being offensive is a tall order. It means, Behr added, "that you need the lowest common denominator," which frequently results in "fuzzy sweet things that can't offend anybody." It also means, as the examples here show, some pretty bizarre outcomes. Suggestive of a genetic experiment gone terribly wrong, Wenlock was—get ready—a blob of steel (to represent the foundries of Bolton) with a bump on his head (to represent the light on London’s famous taxi cabs) and friendship bracelets on his wrists (to represent the Olympic rings.) And why did Wenlock have just one eye? According to the IOC’s website, “his eye is the lens of a camera, filming everything he sees.” Like, say, terrified children running away as fast as they possibly can. After a mountain goat named Chamois got fired as Albertville’s Olympic mascot, this strange five-pointed creature named Magique got the job. On a thematic level, he worked well enough, wearing a snowsuit and the French national colors. But what did a tiny, five-pointed man have to do with the winter sports? And what was he, anyway? Variously called a “show imp” and a “mountain elf,” Magique was actually a “little imp” according to the IOC—which explained him no further. But if he confused attendees, Magique proved more useful as part of a computer teaching program taken by the games’ 7,924 volunteers. Ready? Let’s see if you can keep up with this. “Bei jing huan ying ni” means “Welcome to Beijing.” Now, take each word and double the syllables to get Beibei, Jingjing, Yingying, Nini and Huanhuan. Next, apply each name, respectively, to a fish (to symbolize water), a panda (to represent the forest), an antelope (to symbolize the earth), and to sky and fire. And what do you get? The Fuwa, five “good luck dolls” that were possibly the most confusing mashup of Olympic mascots in history. Created for the Beijing Olympics in 2008, these characters were actually the winners in a global contest that garnered over 3,000 submissions. Unfortunately, after an earthquake, floods and mudslides struck China in the weeks before the opening ceremonies, many Chinese citizens blamed the “Curse of the Fuwa,” contending that there was no good luck in any of them. Meanwhile, the rest of the world wondered if the Fuwa were children, animals or space aliens. Beaver pelts were central to the development of Canada in the 17th century, so when Montreal was chosen to host the 1976 Summer Olympics, it made sense to go with a beaver mascot. Not only was the creature already on coins and stamps, the beaver’s traits of patience and hard work fit nicely into the Olympic ideal. The problem wasn’t the beaver as such, however, but with the minimalist rendering. Stripped of its legs, ears and face, Amik (the word for beaver in the native Algonquin language) looked a lot like a poop. When the IOC selected Calgary to host the 1988 Winter Olympics, the Calgary Zoo took on the task of choosing a mascot. Seven thousand Canadians submitted suggestions and, believe it or not, these brother-and-sister bears were the best of the lot. Dressed up as cowboys, the bug-eyed Heidi and Howdy wore expressions that suggested a mild form of psychosis. But they were harmless. After all, what’s to fear from two polar bears whose names derive from “Hi” and “How do you do?" When a nervy skier heads straight downhill, it’s called a Schuss. In 1968, Schuss struck the good people of Grenoble, France, as a good name for this mascot. While he was sold as a souvenir at the games, Schuss wasn’t an official mascot. He did, uh, birth the idea of Olympic mascots—which the IOC enshrined in 1972 when a striped dachshund named Waldy became the official mascot for the Summer Olympics in Munich. Regrettably, many attendees didn't take to the name Schuss, and called him "The Skiing Sperm" instead.